LENGTH X WIDTH X HEIGHT: 176.4 x 70.5 x 61.4 in. BOTTOM LINE: The Nissan Leaf has advanced from a fairly small to a mid-size sedan that can be a real player in the electric car market. Electric cars have been hampered fro years by range anxiety. Early electrics had ranges of less than 50 miles before requiring recharging. Tesla leapfrogged its competition by offering a claimed 250-300 mile range. The competition is now heating up. 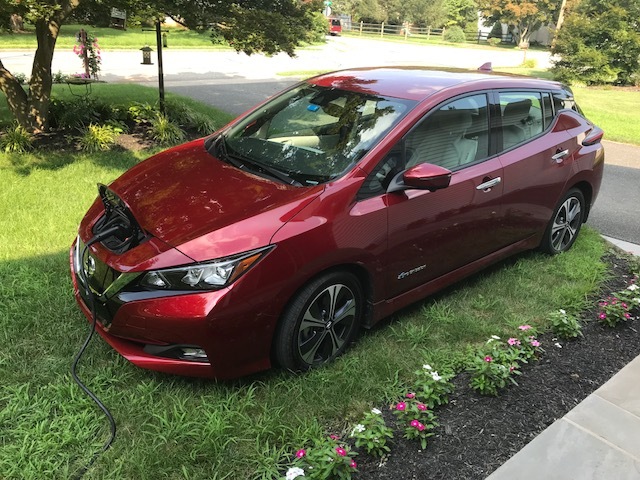 The Nissan Leaf was one of the first mass-market full electrics, and the first iteration forced drivers to be constantly aware of how much charge remained and how far they could go before running out of juice. The redesigned 2018 Leaf sports a larger 40Kwh battery that can allow the Leaf to travel up to 170 miles on a full charge. That should mean no range anxiety, except…. We drove the Leaf for four days without recharging. I had reservations for dinner at a local winery that was 16 miles away (according to my GPS) and I had 50 miles of range left in the Leaf. I could have detoured slightly on the trip home if necessary to reach a charging station, but I decided to gut it out and we made it home with 10 miles to spare. Coasting down hills helped in power conservation. However, I charged the car overnight from a 110-volt outlet. In the morning, only 70 percent of power appeared on the meter. A second night brought it up to 100 percent and 170 miles, but I was still reluctant to try a 130-mile round trip. On my normal “handling hill,” I used 5 miles in range climbing the hill, and none going downhill. It was the same on the return trip. Overall, I am impressed by the Leaf. Silent operation is a plus and can be addictive. True, there’s some tire noise that intrudes into the cabin, but it is slight. The electric motor delivers enough power to keep up with other vehicles on the road. There is no lack of power, thanks to the electric motor that delivers instant torque from 0 rpm. Handling is also very good for a small car. The suspension is firm, but not too firm. It seemed strange to have (almost) sports car handling from a small car and no sound. Among the new technologies in the Leaf is the e-Pedal, that allows the driver the simplicity of accelerating, decelerating and stopping the car by using the accelerator pedal alone. By releasing the accelerator, the Leaf will come to a smooth and complete stop without the need to press the brake pedal. Front seats are comfortable and invite silent touring. Rear seats offer cozy legroom, and I hit my head on entering the back seats. There’s adequate cargo capacity, and with the rear seat backs folding easily, I could fit my golf clubs back there. In fact, with a little creative stowing, I could fit the clubs there without dropping the back seat backs. The driver faces a simple instrument panel that consists of a speedometer on the right and, most important, range details on the bottom (percent charge and range). The navigation screen is clear, with Nissan’s reverse camera adding a 360-degree “overhead” view. There’s no gear selector per se. In the center of the console, right where your hand rests, is a mouse-like tool. Like a good mouse, it is comfortable to use, and like some similar shifters with a stalk of some kind, it’s easy to use. Shift the “mouse” to the left and down to hit drive, shift it to the left and up for reverse. Park is a button in the middle. Overall, the Nissan Leaf may not win the range wars, but it is a perfectly useable electric car with all the attributes you would expect. It is a big improvement over the previous generation in all areas. The 2019 Kia Sorento claims its place. New faces covering the new face of Ford.